Before you send out your novel to a literary agent or a book publisher, make sure it has been edited not only by you, but a professional editor. 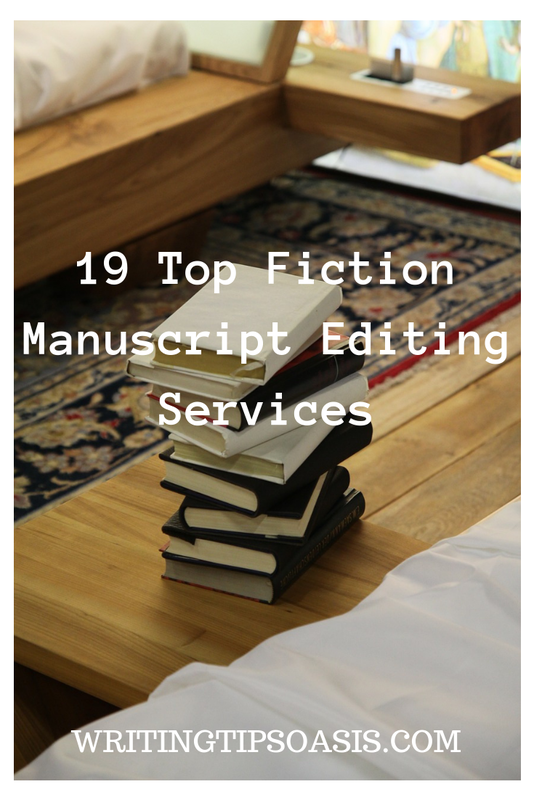 In your search to find a suitable book editor, take a look at the following 19 top fiction manuscript editing services. Note: When selecting an editor for your fiction book, ensure you do your due diligence. Ask a potential editor (including those service providers below) for samples of their work, question them about their experience, and carefully read reviews written by previous customers. Standout Books Publishing Services was founded by Bronwyn Hemus and Alex Hemus in 2013 in California. As an independent editing and publishing service, Standout Books Publishing Services also provides authors with high-quality editing services. They offer editorial consultation, manuscript critiques, developmental editing, comprehensive editing packages, and copyediting options. The editors can help any aspiring fiction writer out there flesh out their character development, scenes, adhered to consistent point of views, address potential plot holes, and even spice up character dialogue to make your story truly come to life. Their editing services can start at $0.02 per word (working upwards for more comprehensive packages). For more information, check out their website for more information on editing services that they provide. Mary Kole has over ten years of experience in the publishing industry, so it’s safe to say that she understands what potential publishers and literary agents are on the lookout for when it comes to new manuscript submissions. She founded Mary Kole Editorial in 2013 and is based out of Minneapolis, Minnesota. Mary offers a variety of editing services like partial novel manuscript editing, query and synopsis consultations, full novel manuscript edits, submission packages, manuscript reports, and even picture book editing. Mary is an incredibly transparent editor, with all her rates clearly listed on her website. Her services begin at $149 and increase the more comprehensive the service. The editors at the Book Butchers are brutally honest, but it’s all for the sake of the author! Many of the Book Butchers’ editors are successful authors themselves, many of them having at least an MA in Literature and two years of full-time editing experience. Based out of Portland, Oregon, they offer three different tiers of editing services. For more information and testimonials, you can check out their website here. Beginning at just $0.02 per word (the “Quick Kill"), they offer proofreading, copyediting, can fix spelling and grammar errors, and help write a summary revision to better help authors make needed changes. Their second tier starts at $0.04 per word (“Extra Bloody), which provides all of the services of the previous tier plus a review of organization and content, plot and placing, and a manuscript review. The last tier that they offer goes at a rate of $0.06 per word (the “Perfect Murder"), which includes all of the services in the first two tiers plus formatting services for both print and ebook publications and pre-publication proofreads. Operating since 2008, DLA Editors & Proofers is an editing service for all types of writers based out of Houston, Texas. For the fiction author, they provide services that address plot underdevelopment, narrative inconsistencies, manuscript strengths and weakness, and will even provide advice on how to acquire an agent or publisher! They also offer genre-specific editing and general proofreading. They’ve worked with authors like Dimitrije Medenica, author of “The Good Healer," and Jim Gilliam, author of “Point Deception." The editors at DLA are more than happy to provide you with a free sample. They’ll happily edit your first three thousand words for free to make sure you’re satisfied with their style and work going forward. You’ll have to submit a bit of information in order to receive a free quote using their online submission form, found here. As a successful author herself, Marcy Dermansky provides editing services to help all aspiring fiction writers create a flawless manuscript for submission. Author of “The Red Car," named Best Book of the Year by the San Francisco Chronicle and the Huffington Post, Marcy works out of Montclair, New Jersey. She offers editing services and works one-on-one with authors on novels, short stories, and even creative non-fiction. She will thoroughly examine your manuscript, copyediting your work. She will also include a detailed letter that address such topics as voice, pacing, plotting, character development, and dialogue quality. Lastly, Marcy will provide time for a one-on-one consultation to provide feedback on how to better revise your manuscript before submission. For more information, feel free to check out her website and contact her to get a quote. The editors at Dragon Fly Freelance are readily available to assist in all sorts of writing edits, including fiction manuscripts, academic thesis and dissertations, and even scientific editing services. For fiction writers looking for a professional editing service with tons of experience and reliable turnaround times, Dragon Fly Freelance may be the option for you. They operate entirely online, and are able to service authors all across the United States (and the world beyond). Their book editing service convers grammar, punctuation, spelling, sentence structure, paragraph formatting, and overall narrative flow. Dragon Fly Freelance offers incredibly competitive rates. For more information on how much they would charge for your manuscript, consider sending them a brief message on their online contact form. Their editors will be in contact with you as soon as possible to get started on your editing journey. The editors at Scribendi understand that a polished manuscript will help their authors have a better chance at standing out in today’s literary market. Whether you’re a first-time author or an experienced author, an editor will be your greatest resource to sprucing up your manuscript. Scribendi is an editing service that offers manuscript critiques, editing, and proofreading. They even offer a manuscript proofreading and query letter package for authors seeking out representation and publication. While their home office is based out of Ontario, Canada, their online platform allows extensive reach to writers all over the world. You’ll need to contact them in order to receive a quote for your manuscript, as there are several factors that will determine their asking price. The need to know how long your manuscript is, the type of manuscript editing service you’re looking for, as well as how quickly you would like the project to be completed. To use their quote calculator, click here. While BookBaby is known as a self-publishing company, they provide fantastic resources for budding authors everywhere. They have an entire department dedicated to book editing, and it would be silly to pass up the opportunity to work with qualified editors to help make your manuscript shine. Beginning at $7 per page, you can get a copyediting package that checks for typos, spelling errors, grammatical errors, and attention to punctuation within six to eight business days. In addition, they provide line editing services for $10 per page which goes over narrative development, word choice, story structure, character development and style within eight to ten business days. Marcia Trahan is an editor who specializes in memoir and fiction editing. She has been a professional book editor since 2004 and has an MFA in Writing and Literature. Based out of South Burlington, Vermont, Marcia is a dedicated editor who loves to work with a variety of genres. Some of her services include manuscript critiques, copyediting, and even publishing consultation. Her critiques will provide you with an overall summary of your manuscript’s strengths and weaknesses, along with an honest evaluation on how to improve. Marcia’s rates begin at $50 per hour, with a two hour minimum. She notes on her website that she does offer a 10% discount for full prepayments of projects worth $300 or more. For more information, click here. Based out of Corryton, Tennessee, Victoria Griffin is an author and editor who has worked with authors like KL Watkins, author of “I Am a Traveller," and Susan F. Pruitt, author of “Noelle’s Destiny." As an author herself, she knows exactly what literary agents and publishers are expecting out of your manuscript. She offers editing services like developmental editing and line editing (starting at $0.025 per word), proofreading (starting at $0.015 per word), manuscript critiques (beginning at $0.01 per word), and even offers submission packages ($100), query critiques ($30), and synopsis critiques ($40). First Editing is an editing company that is fully equipped to help both first-time authors to successfully published writers. They offer advice on plot structure, story development, character development, tone, pacing, setting and more. Their editors are highly qualified and more than capable of helping you work out the bugs in your manuscript until it’s absolutely flawless. You can contact them directly to get an exact quote on how much they would charge. First Editing offers four different tiers of editing packages, ranging from basic to executive. Their basic package includes copyediting services, recommended for those writers who have full confidence in their manuscripts, but need one more professional lookover before submission. Their standard package not only includes copyediting, but line editing, as well. For more information on their editing packages, check out their comparative chart here. Based out of Los Angeles, California, The Artful Editor was founded by Naomi Kim Eagleson in 2010. With an MFA in Creative Writing and a BA in English Literature, she and her team of editors are excited to work with new and established authors to meet their editing needs. The Artful Editor has worked with authors who have won several awards, been interviewed on TV, radio, and podcasts, and been featured in papers like the Los Angeles Review of Books and Hollywood Reporter. They offer manuscript critiques, developmental editing, line editing and copywriting, proofreading, and what they call the “everything edit" which is a comprehensive look at your manuscript. Their editing rates range between $0.015 to $0.045 per word. They can also provide assistance with query letter editing and book cover design. Ronlyn Domingue has been an accomplished editor for nearly 15 years. She has an MFA degree in Creative Writing and has won several awards for her own original novels. Based out of southern USA, Ronlyn provides developmental editing, copyediting, and proofreading services. Her rates for copyediting begin at $40 per hour, with a rough turnaround time of forty hours for a 50,000 word manuscript. For her proofreading services, her rates begin at $30 per hour. For her more specialized and thorough service of developmental editing, her rates begin at $100 per hour. For more information, she advices that you contact her via email to get a better idea of what your project will cost. Based out of Canton, Georgia, A Novel Edit was founded by Beth Hill, a successful editor and contemporary romance author. With an undergraduate degree in psychology and an MBA in human resources, Beth is a capable and hardworking editor that will help polish your manuscript. She offers editing samples to ensure that you’re work and writing styles are compatible. She is happy to provide editing services to the first thirty pages of your manuscript, or a full edit where by she thoroughly combs through your story for errors, plot holes and more. You can contact her directly through her website to get an exact quote, as her rates are based on your work’s word count. Based out of Los Angeles, Jennifer Caloyeras is an editor and novelist who’s published two young adult novels, “Strays" and “Urban Falcon." She has a BA in English and an MA in English Literature, as well as an MFA in Creative Writing. She is more than happy to provide manuscript critiques for short fiction and novel-length manuscripts. Since she also happens to teach English, she schedule is jam packed and therefore requests that interested parties send her a query letter first to discuss her editing services. Her critiques would include line edits and comments in your margins providing feedback on how to improve your story. Leigh Hogan is copyeditor based out of Georgia, USA. She has worked with authors like Trina M. Lee, author of books like “Blonde & Blue," “Once Bitten," and “The Wicked Kiss." She offers free edit samples of the first ten percent of your manuscript to make sure that your work styles are compatible. She offers manuscript editing for the rate of $7 per one thousand words, and also offers a free beta reading package for authors looking to gauge potential audience response. C. S. Lakin lives near San Francisco in California. She’s both an author and editor who has written self-help books on writing and the literary industry like “Say What? The Fiction Writer’s Handy Guide to Grammar, Punctuation, and Word Usage." She’s also written a few contemporary fiction novels like “Someone to Blame," “A Thin Film of Lies" and “Intended Harm." She offers one-on-one consultations, starting at $75 for thirty minutes or $150 for a sixty-minute session. She also offers manuscript critiques, basic proofreading, copyediting services, and coaching for authors seeking mentorship. For more information, you can check out her website, found here. Founded by Maya Rock in 2010, this New York-based editor has a long and successful portfolio. She’s worked with award-winning authors like Clara Kensie, author of “Deception so Deadly," and Dhonielle Clayton, author of “The Belles." Maya herself is an author of the young adult fiction novel, “Scripted." Some of her editing services include editorial letters, substantive edits, one-on-one phone consultations, query letter development, synopsis development, an agent query prep package, and substantive chapter by chapter edits. Maya’s rates depend entirely on word count, so she recommends that you contact her either via email or phone to get a quote before proceeding. Based out of Los Angeles, California, Katie McCoach is the founder and primary editor of KM Editorial. She has extensive experience as a developmental writer and specializes in young adult fiction in a variety of genres. In addition to developmental editing, she also offers substantive line editing, hourly coaching, and manuscript reports, copyediting and proofreading, and final manuscript reviews. According to her website, she offers slightly different rates for works that are under 30,000 words. While her rates can vary depending on word count, her average rate is roughly $0.24 per word for copy editing and proofreading. Do you know of any other fiction manuscript editing services? Please tell us about them in the comments box below! © writingtipsoasis.com. All rights reserved.